This came up in another thread. I see a lot of Bajas running four rear lights instead of two. Presumably this is because of the need to have separate turn signals and brake lights in the wiring configuration. Most bajas have a "Three Wire system", meaning one wire for brake, one for left turn, and one for right. There is an adapter you can get for less than 10 bucks to run your turn signals and brakes on the same light. Being in the RV industry, we use it all the time when towing an american trailer with a foreign car. 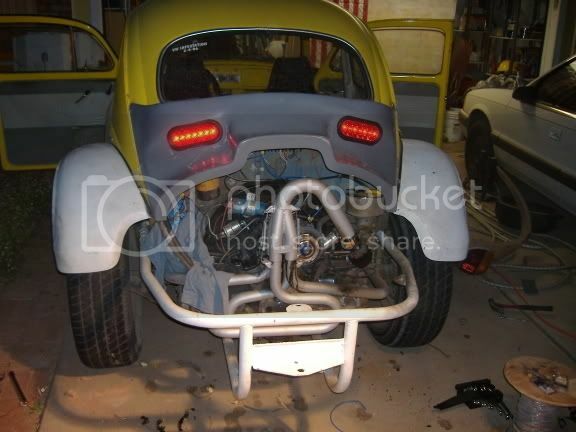 When you install this in your system, you can run one set of rear lights. I have seen them before, but usually alot more than $10. Do you have a part number and manufacturer? hey 57baja, did ya ever see me L.E.D. tail conversion?? I used that same box. Mine has four lights, because I liked the look, but only the outer ones are turn sigs. all four are brake and tail lights. I made a diagram when I wired it, I'll see if I can find it. LED's... They're the way of the future. That would have been nice to know, I built my own. AZBAJA how did you build your own do you have a schematic and what did it cost in parts? Go ugly early in the night, that way it doesn't turn to a 2:00AM fox hunt. I will see if I still have it. If not I will draw one up. it's real simple to make. You need 2 Relays for the rear and 2 more if you do the front blinker running light thing. But her is a quick over view. Take the center post of the relay and run it to the bright side of the tail light aka brake side of the bulb. run the contact side to your master brake switch. so this way when you hit the brakes you tail lights will come on. on the no contact side hook up a hot wire to a 2 prong flasher and the wire out of that to the no contact side of the relay. No here is the magic, hook the wire for your turn signal to the real activashion contact. So when you hit the blinker the relay flips and now it on the flahser side. You can "T" the second relay with the same wire from the brake switch and the flasher. Just make sure you do not "T" the wire from the signal arm. if you do that you will have a nice set of Emergancy Flasher. For your emergancy flasheruse a toggle with 2 sides. one side hooks to each relay and the the the contact side can "T" then go to your hot. Flip it and both relays come on and now you have Flashers. Stuff it all into a small Radio Shack box and bolt it under you dash. If you solder you can make it evan smaller with smaller relays but heck I just used some Ford Relays almos the same thing as the Black Bosch realys but a little smaller. This has been working for years now, well over 13 or 14 years now. ignore the periods. it should look like this. ... or you can buy the $10 converter. Just a bump cause it comes up now and again.